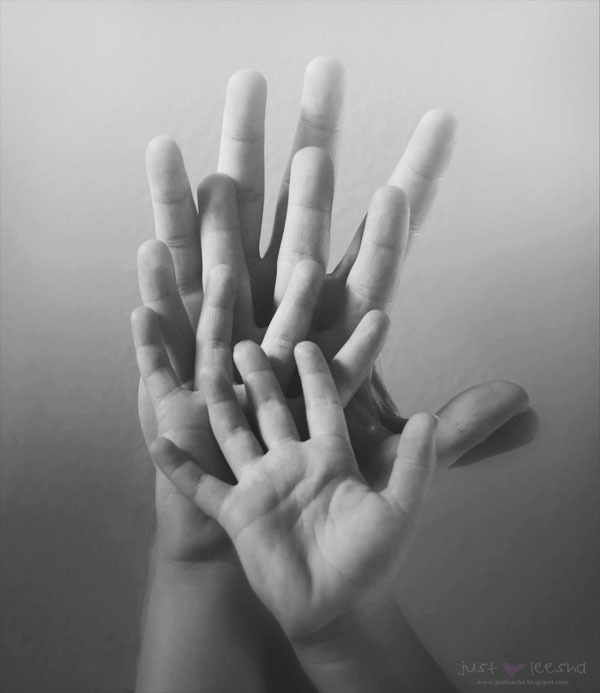 A family portrait… of our hands. You probably won’t notice, but little sisters middle finger is special. When she was a little over one year old, she was holding onto the back of our dining room chair and fell forward. When she landed her finger got crushed between the chair and the floor, taking the top off with it. It was a terrible ordeal, but its all healed now and it doesn’t seem to effect her writing too much. Plus, she thinks its cool. This is my entry for Raise Your Hands (with special fingers) at I Heart Faces this week. what a great idea for a photo! Love the shadowy feel of this! What a special shot! So creative! What a gorgeous idea, Leesha! very nice leesha! love the greyness coloring. I love this photo! So creative and so simple, beautiful! I really love the idea and the photo! Great Family Portrait – unusual yet a great memory of family life. Simple and precious.. Love it!